Bird Envy is one of the most intriguing little book of stories I've ever read. Ms. Pokrass uses words in her tiny stories in ways that defy conventional usage. Her points of view just grabbed and shook me. She has to be the Queen of Flash Fiction. I've never read flash as engaging. 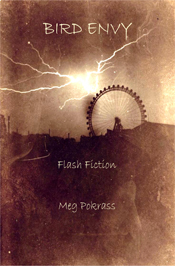 Her Flash Fiction starts in the middle and invites the reader to figure out the how her stories might begin and how her stories might end."